I don’t think even I have ever worn this much makeup. This lad is in his second season radiating new manly charm which is bound to thrill a million female hearts. We wish, however, that he had been less generous with the lipstick. 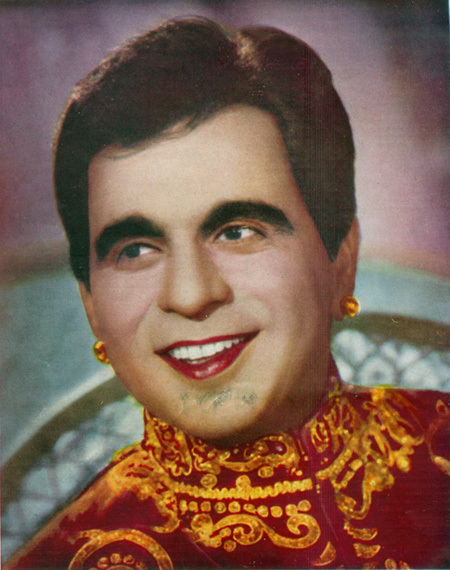 Dilip Kumar plays a dynamic role in “Kohinoor”, a thrilling romance produced by Dr. V. N. Sinha for Republic Film Corporation. Posted on July 8, 2009 at 3:35 pm in Baburao Patel's Poisonous Pen, Hindi film history, Hindi movies, Vintage Bollywood images	| RSS feed You can skip to the end and leave a reply. lol! Baburao is soooooo caustic!!! :-) Does he ever mention the “upholstery” of the male variety? There was quite a lot to of it around in the 50s. Dilip may be a tad generous with the lipstick but I must admit that he rocks it – I would never dare to wear that color! Think he had to wear lipstick like that to achieve a particular look in a black and white movie? If that still is actually from Kohinoor (which was B/W), then possible. LOL about the comments beneath Mala Sinha’s picture! He has been kind in pointing out that she needs to lose weight – ref to “we need Ramazan every alternate month” which as we know is the month of fasting! post more please…. hilarious stuff! 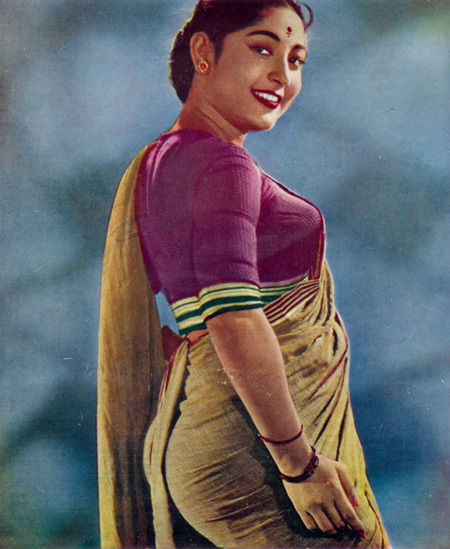 in a nine yard sari, everybody seems to have… you know what, and i think that looks great! A sto the lipstick, I think it depned son the film development. the fotos were not always image-true during those days. I don’t recall any mention so far about male upholstery, but that doesn’t mean he didn’t! I am pretty sure in fact that he’d have no qualms about it. I just realized I could do with a little less upholstery and lot more lipstick. Hee :) I’m with you on the upholstery-lipstick thing too. Our leading ladies were pretty well endowed (and without silcon too) in those days, but there are some additional paint strokes added in strategic places for sure. I remember those days the movie advertisement hoardings and billboards used to add more than a few inches here or there to make the heroines and VAMPS more attractive! Indian males those days loved what were then called the ‘Ajant-Ellora’ type, well rounded ‘thunder thigh’ women. That should read ‘Ajanta Ellora’ types. That is AWESOME, Ajanta-Ellora types :-) Clear evidence that I was not born in the right era myself!